Reason, a virtual rack of music creation gear, has faced one common complaint from users over the years: it can't record external audio. Even a tool called Record ( ) from the developer, focusing on audio recording, editing, mixing, and mastering, couldn’t provide satisfaction. After all, synthesizing sound in the box is great, but for many, creative music making requires audio input. Many Reason users wanted sampling without the need for another tool. After a long wait, recording in Reason is here. But this upgrade isn't just about satisfying a long-standing feature request; the creators have gone further. A new, deceptively simple drum machine blends some of the flexibility of software with the working methods of hardware in a way many software applications have failed to do in the past. If beats, percussion, and sampling are a part of your musical process, Reason 5 could be a big breakthrough. Kong, a virtual drum designer, is the show-stealer in this upgrade. Its centerpiece is a four-by-four grid of virtual percussion pads, reminiscent of classic sampling hardware like the Akai S9000 and MPC. Kong, the new “drum designer” drum machine in Reason 5, is actually a collection of modules for generating percussion sounds, playing samples, and adding effects. Those samples are triggered on a four-by-four grid, with powerful grouping and editing features like a Quick Edit Mode that lets you adjust various parameters all at once. By default, Kong can load a set of samples covering a range of genres, just like the ReDrum drum machine that’s been in Reason since the beginning. But it’s when you begin customizing and programming your own sounds that it really starts to shine. Each pad can contain your choice of modules for sound generation and processing. To synthesize sounds, you can choose from a sampler (a downsized version of the NN samplers in previous versions), REX-format loop player, physically modeled sounds designed to emulate real percussion, or synthesized sound sources. You can then add rich, terrific-sounding effects like a specialized compressor and reverb, a retro-tinged tape echo, and a wild, snare-simulating effect called Rattler. Each of the nine drum modules is really an instrument in itself, even before adding the effects. The synth snare, hat, tom, and bass drum, sound thick and warm, each with custom tone controls for manipulating sounds. The physical models are capable of reproducing realistic drum sounds without samples, but can also be stretched to mind-bending creative results. Thanks to those new input features, in the NN-Nano sampler module, you’re always one click away from live sampling from a mic or other source. Mobile users may even wind up beat-boxing a track in a hotel room. Propellerhead’s Record offers audio input, but Reason makes sampling into an instrument. Other tools, like the Ultrabeat instrument in Apple’s Logic ( ), have attempted to bring these features together. But Kong is unique in the way it combines extensive sonic powers into a compact, easy-to-understand interface. It’s capable of extensive sound design options, but, like the hardware it mimics, contains those features within accessible controls. There are significant pad grouping options for power users, and convenient controls for mapping pads so they’re easy to play on a keyboard or drum pad controller. Whether editing individual pads, or via a feature called Quick Edit, editing parameters across the 16 slots, advanced sound creation never feels like work. The sum of all these parts is one of the best software drum machines in recent memory, even if it were to stand on its own. Reason 5 tweaks and polishes usability in a variety of ways. For songwriting, a new Block view provides an easier way to work with chunks of songs like a verse, intro, and chorus. It’s a welcome feature familiar from Digital Audio Workstations like Cubase, and one that makes writing and arranging in Reason easier. The Sequencer is much-improved, as well, borrowing some clip, editing, and navigation features from Record, and improving MIDI note recording and loopin. Features taken for granted in other sequencers, like tap tempo and custom precount bars—think 5, 6, 7, 8—have finally made their way into Reason. Sequencing in Reason had traditionally been a chore, especially for those used to other tools, so it’s nice to see this feature mature. Sample recording and live audio inputs are now available throughout Reason. 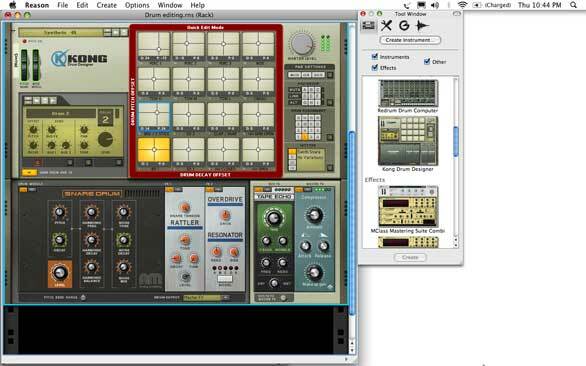 A sample editing window lets you adjust loops for instruments like the Kong drum machine. Reason 5 improves upon some of its unique strengths, as well. Routing patch cords between virtual devices is a powerful design feature that has long made Reason’s sound production facilities modular and customizable. It’s now much easier to use, thanks to improved navigation and routing facilities and device grouping, preventing the jumbled spaghetti of simulated patch cords you’d find in more complex setups. But the big feature remains audio input. In addition to sampling into Kong, you can route audio anywhere: you can finally use a mic or instrument with the vocoder, insert audio in the mixer, and process sound with your custom Reason device racks. There’s even an included editor with which you can adjust your recordings and create loops. REX audio slicing: evolution or dinosaur? For all the improvements, there remain times when Reason 5 seems stuck in its ways. The most painful is REX. Propellerhead’s ReCycle, a tool for editing audio into pitch- and tempo-independent slices, was revolutionary when introduced. Reason 5 finally improves upon the use of ReCycle’s REX samples in the tool. REX files are a powerful sound source in Kong, and the Rex Looper Player at last has been replaced with a more modern version. The Dr. Octo Rex Loop Player can switch between multiple audio loops, for triggering different patterns. It also has expanded functionality for taking sound slices and applying parameter automation, either in the player itself or routed within Reason’s modules, which can create subtle or far-out rhythmic effects. Dr. OctoRex is a beefed-up version of Reason’s original REX-format loop player. It offers new features like sample switching and parameter editing for slices, but you’ll still have to prepare your own samples in advance via the separate ReCycle program. The problem is, REX functionality within Reason requires that files be prepped in advance. To do that, you have to buy ReCycle, a separate program, with a separate workflow, for $250. With sample slicing common in DAWs like Logic and the centerpiece of tools like Ableton Live, that’s bad news for anyone not satisfied with using pre-built REX sound libraries. Reason deserves integrated, modernized REX manipulation in the box, especially now that it has audio inputs and sampling. Reason 5 is a must-have upgrade for anyone who uses audio inputs or samples, or wants to program beats. For those who haven’t used Reason for a while, Kong is worth a second look. Superior sound design power coupled with elegant, efficient editing makes for one of the most accessible, fun-to-use drum machines in software yet. Improved REX playback functionality only makes the inattention to the format and ReCycle player more apparent; it’s a blemish on an otherwise mature program. But REX aside, Reason proves, in the words of the old ketchup commercial, good things come to those who wait.